Ford teases its forthcoming Mustang-inspired electric crossover SUV once expected to be called the Mach 1. 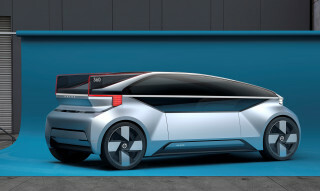 Volvo introduces its idea for self-driving electric cars with the 360c concept. 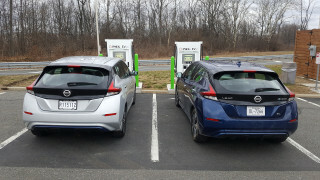 Electric cars steal sales from hybrid vehicles. And Ford requests an exception to electric-car noise rules. All of this and more on Green Car Reports. 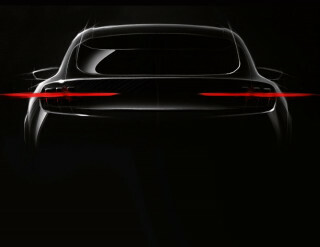 Ford released a teaser photo of its new 2020 electric SUV. The company floated the idea of calling the car the "Mach 1," but enthusiast backlash buried the nameplate. The Volvo 360c self-driving car concept made its debut and boasts an electric powertrain and a lounge-like area akin to Ikea. One day, Volvo thinks it could displace short-distance air travel. 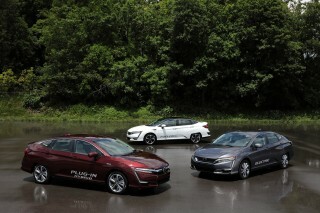 Battery-electric cars are leaving sales of traditional hybrids behind, but it's not the best news. Gas and emissions savings could be much higher if more hybrids continued replacing conventional cars. Ford requested an exemption for upcoming electric-car noise regulations for its police vehicles. In 2020, electric cars will be required to make noise under 19 mph, but Ford wants its police cruisers to keep things silent to sneak up on criminals. Volvo has proposed standardizing self-driving car communications. The Swedish make wants to ensure human drivers understand a self-driving car's next move regardless of the brand. Finally, ahead of its passenger-car cull, Ford has cut national advertising for sedans and hatchbacks. Soon, the automaker will sell only crossovers, SUVs, and pickups.